Using sharp chisels, craftsmen cut the steel plate into shape and hammer the edges. Others bend, cast and attach the wire hung counterweight and check balance and swing. Village painters hand paint faces and important details. Apprentices do base paint and more mundane details. The distressed finish is the result of an old and proven system of combined layers of paint of slightly different composition. The final step is a hand rub with dark colored beeswax giving it the final finish and feel. 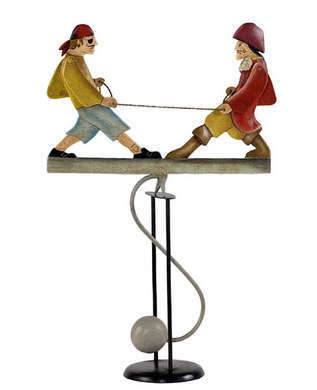 In the manner of their antique predecessors, our balance toys are true originals.